Murano, Burano and Torcello are three Venetian islands that are super easy to get to from Venice, Italy. They are each so different, and are definitely worth a day trip. This post is a quick read full of photos from the three islands..
To get from Venice to the other islands, we bought a day pass for the Vaporetto, which is a public transportation boat. It’s basically like a bus on the water. The boards at the stops tell you which lines go to which islands, so it’s pretty easy to know which boat to get on. Our first stop was Murano, which is the island known for glass blowing. We wandered in some glass shops and explored around the island, which was super cute. Next up was Burano, which is known for its amazing colourful buildings and lace making. Burano was by far my favourite island, because of how colourful it was. I’d never seen anything like it before! It was blazing hot the day we went, but it was so worth it. Since we still had some time in the day, we decided to check out another island nearby, Torcello. Torcello is apparently the first Venetian island to be populated, but now there are only about a dozen people living here! Torcello has far less buildings than the other islands, and much more nature. The Cathedral of Santa Maria Assunta is the main attraction here, seen in the photo below. We didn’t go inside though, because that day there was actually a big wedding happening at the church! We saw the bride and groom come out of the church, and everyone congratulating them. How fun! 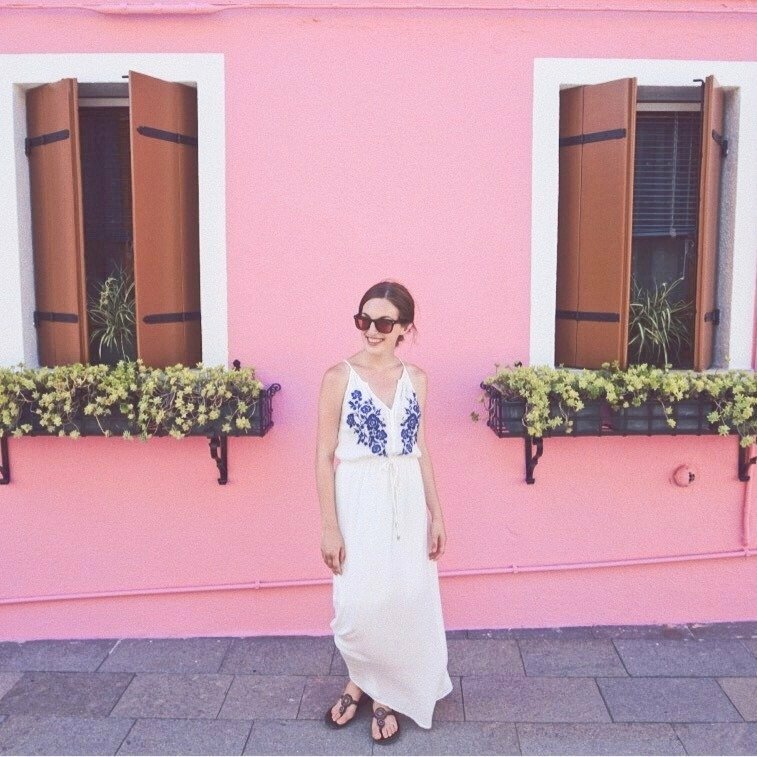 If you go to Venice, I highly recommend checking out some of the other islands, especially Burano! Want to save this to your travel wishlist board on Pinterest? Save this post for later! Beautiful place! I visited Venice when I was younger but I would definitely want to go again. 🙂 The colorful buildings look amazing! What a beautiful photos. Ps. Be sure to go to Piran the next time you go to Venice too. It’s in Slovenia, but so close to Venice and a must see. Hoping to travel over next year with one of my besties to celebrate our 50th birthdays!! This town doesn’t even look REAL —- SO beautiful and colorful!!!! When I saw your photos last night, my mouth was literally gaping open. I can’t get over all the color and beauty in this one spot! Must look into a visit! thanks for sharing this! Thank you so much Shan! 🙂 I was so amazed by all the colours as well! It’s definitely a must for the travel wishlist! 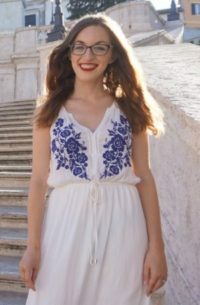 What a perfect outfit to explore Italy. You look fabulous! It matches the colorful building. You’re making me want to book a vaca right now. Oh wow!!! Italy looks gorgeous!!! Loving all those colorful buildings! Ahh you make me want to travel so bad! I love all the colorful buildings in Burano- it reminds me of Valparaiso in Chile! And that outfit you wore is so so cute. Loved seeing your pictures from Italy! Thank you so much! I’ve never been to Chile, but I do love places with colourful buildings!